Pet emergency evacuation plans are just as important as family emergency evacuation plans. 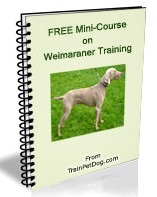 Plan ahead for your Weimaraner, and you will not have to abandon your pet in a dangerous situation. While we will talk about hurricanes and emergency evacuation plans for storms below, the same principles apply for other disasters, although you might not have as much time to react. Don’t Leave Your Pet Stranded in an Emergency! Most people do not want to leave their pets alone in their homes, during a natural disaster. Unfortunately, most emergency shelters and many motels & hotels do not allow pets, especially large animals like Weimaraners. You can avoid having to abandon your dog or leave her home alone, with a little foresight and planning ahead. A crate can help your Weimaraner dog feel safe and secure. Include your pets in your emergency evacuation plans. When planning for your pet’s safety, there are several things to keep in mind. And, you can do a lot of these things ahead of time. If a hurricane is approaching your town, you will have many things to do. You will need to prepare your home for the storm, bring in outdoor tables, chairs and grills, contact family members and gather and pack essentials for your family’s evacuation. Do as much as you can, ahead of time! Where will you take your dog? – Most shelters will not accept pets, although more and more, we do see some that will take them.To be accepted into a shelter that allows pets, you will need to have a place to keep your dog quiet and a way to keep him under control. Shelters require a dog pen and a collar and leash. Hotels and motels – Alternatively, will your pet emergency evacuation plans include taking your Weimaraner with you in your car? In that case, you will need to have reservations at a pet-friendly hotel, or you will need to make arrangements with a family member or friend, who understands that your Weim will be coming. Kennel – If you take your dog to a boarder, make sure that it’s out of the danger zone and that you have made arrangements ahead of time. Other people will be doing the same thing! Rescue Alert Sticker – If you plan to leave your pets in your home (which I do not recommend), get firefighter pet alert stickers to let rescue workers know that there are pets in your home. If you take your pet with you, quickly write “evacuated” on the sticker, so that rescue workers don’t waste time looking for pets that are no longer there. Keep vaccinations current – Make sure your pet has all the vaccinations that she will need to be accepted at a boarder’s or at a shelter. Unvaccinated pets will probably be turned away. Keep the records handy, and place them in your pet emergency evacuation kit. I like to keep both pet records and family records in a portable waterproof file, handy with other emergency items. Pack an Emergency dog survival kit for your pet – Make sure you have everything that you or a designated caregiver will need to take care of your pet. Pack everything ahead of time, and keep the kit handy, so that, if you are evacuated, you can quickly grab it with the rest of your evacuation supplies, and run. 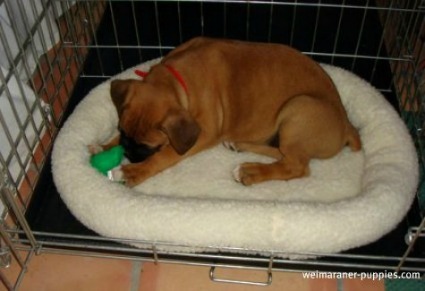 Pet care – If you go to an emergency shelter that accepts pets, you will be required to take care of your pet’s needs. That means feeding, supplying water, walking, keeping him under control, keeping him quiet and cleaning up after him. Be prepared to do these things. Transportation – Do not expect emergency transportation, like buses, to take your pet. You will need to provide transportation yourself. While preparing for an emergency evacuation for your Weim can take a little time, if you develop your pet emergency evacuation plans ahead of time, and gather everything you’ll need for evacuation ahead of time, you can quickly get your family and your pets to safety, when a disaster occurs!